It has turned cold again here in the mountains. This is not unusual for March. So, sitting on the deck with a beer after some garden work has returned to huddling inside to keep warm. If you want to keep warm, nothing beats some adult hot chocolate. 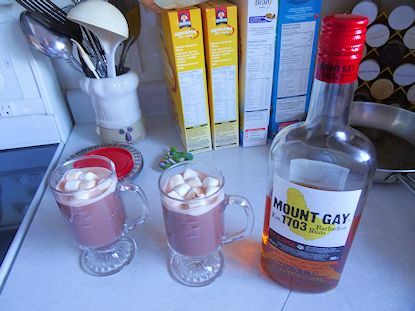 Just add 1 ounce of rum to your hot chocolate and sprinkle some mini-marshmallows on top. I feel warmer just thinking about it. The rum I prefer is Mount Gay Eclipse. It is just a bit more expensive than the cheaper rums. It is an amber rum so it has the full rum flavour missing in white rum without the overpowering molasses flavour of dark rum. It is definitely my favourite. Will defintely Half to try that. Thanks, Norman. You can’t beet a hot rum drink.